When Once Upon A Time airs its 100th episode this Sunday night, it’ll enter an elite club. Precious few shows make that 100th episode benchmark these days, especially if you’re not counting daily programs like Wheel Of Fortune or Dr. Phil. It’s even rarer for a drama—and in particular a family-friendly drama—to hit that mark. It was 2011 when we first went to Storybrooke, and it had this lost in time quality that we’ve maintained. We don’t do a lot of pop culture references in our show, we don’t do a lot of “stolen from the headlines” stories or references, so I think because we have this timeless quality, and because we dip into these fairy tales and we contemporize them, we don’t feel like a medieval show. We’re not completely alien to a modern audience. We’re also not so beholden to the contemporary and social mores that it would become irrelevant tomorrow. Despite the fact that it has 100 episodes in the can, Once Upon A Time is actually a little disadvantaged in the syndication marketplace, and not just because a show about modernized real-life fairy tale characters with questionable life problems could be a hard sell to a big chunk of the marketplace. As an hour-long drama with season-long arcs and characters that dip in and out of the show’s overall storyline, Once is pretty much a fans-only proposition. You can’t really pop in on a Monday for season three’s “Think Lovely Thoughts” and watch the Storybrooke gang fight off evil Peter Pan in Neverland only to come back on Friday for “New York City Serenade” and find that—surprise!—all your beloved TV pals are back in their hometown after having escaped Neverland, except for the protagonist Emma, who now lives in New York, is engaged to some stranger, and has completely forgotten that fairy tales are real. To watch Once is to watch all of Once, in order, and that’s an investment. Selling a show into syndication isn’t just a mark of success for the show’s creators—it’s smart business. Despite all the big-budget stars and flashy advertising, making television isn’t always a winning financial proposition. More shows fail than succeed, especially when you’re lumping in pilots that never see the light of day. So shows that hit that 100-episode barrier, that get sold into syndication, can become a network’s golden goose. That’s why shows that might be floundering in their third or fourth season still get renewed—once they cross that 88- or 100-episode line, their rights can be sold, making them instantly profitable for the network. Production companies even offer discounts to a show’s network, basically saying “please God, keep us on the air. We’ll be cheap, and then we can all make more money.” Sometimes, networks even shove those struggling shows over to Friday or Saturday nights, where they might draw minimal viewers, but still chug along toward the monetary finish line. There are notable exceptions to the syndication success model. Sometimes, shows that barely made it during their first go ’round can find fans after repeat viewings. Star Trek, for instance, only ran for three seasons on NBC in the late ’60s but found success in syndication, ultimately leading to all manner of spin-offs, licensing deals, and Spock-eared superfans. And while The Big Bang Theory’s first-run numbers were never anything to scoff at, the show’s CBS ratings actually grew 20 percent during its sixth season—right around the time it started airing in syndication. Recently, with the move of TV audiences toward streaming services and DVD box sets, success in syndication has gotten even murkier for certain shows. Though Once Upon A Time draws 7.3 million viewers weekly, it’s also already available on Netflix, ABC.com, a number of other streaming services, and in a variety of physical forms. There are hundreds of clips online, and though the fanbase is there, should the show stop producing new episodes, it’s anyone’s guess whether those fans would follow the show to, say, FreeForm or USA. They could instead take their passions to Arrow, for instance, or choose to simply pop in a couple episodes on DVD from time to time. While Once Upon A Time, with its Disney-fied integrations of properties like Frozen and Cinderella, hasn’t been found its syndication prince yet, its outlook is fairly rosy. Some network, somewhere, will probably take it. And even if it doesn’t, it’s still airing on ABC almost every Sunday night. 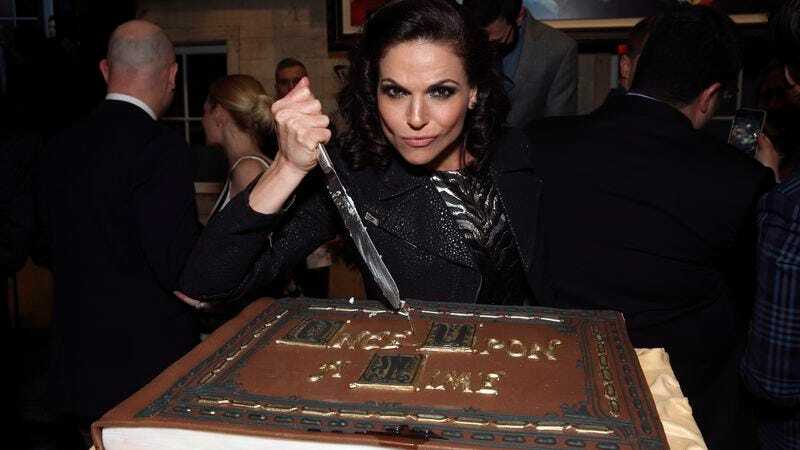 Add to that the staggering figure that the show already airs in over 200 countries (it’s particularly popular in Brazil), and it’s clear: Even by the harshest measures, Once Upon A Time has found lasting success. Unsurprisingly, ABC just announced the show’s renewal, ensuring a season six, and possibly even beyond.